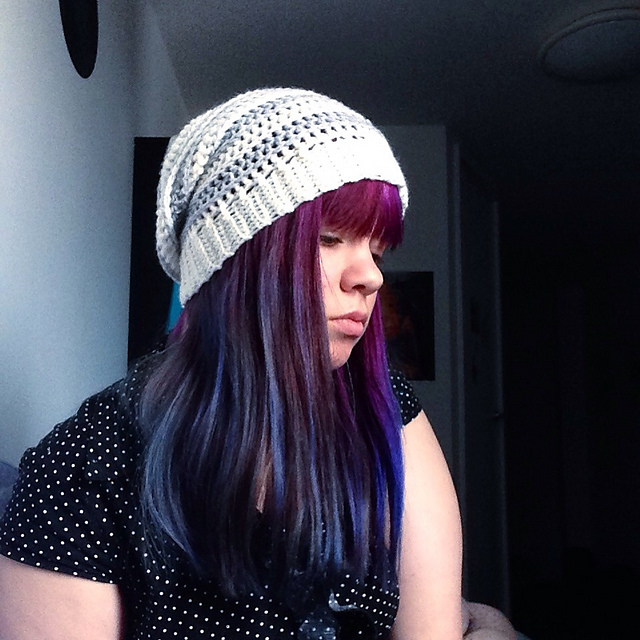 I made this hat using the All Grown Up Striped Slouched Hat pattern. The pattern calls for the hat to be made using an aran yarn, but I used a double knit (a double knit is thinner than an aran). In order to be able to make the hat to fit my head, I only needed to change the length off the hat. I used a 5.5 mm (I) crochet hook and made the small adult size. 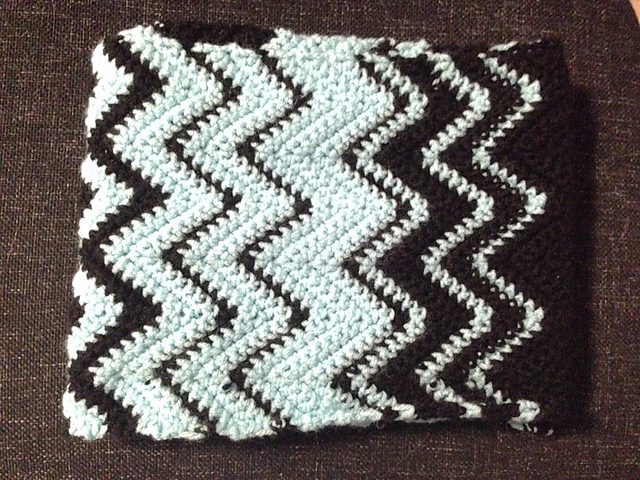 I crocheted about 6 more rows in the stripe pattern than the pattern asked for. 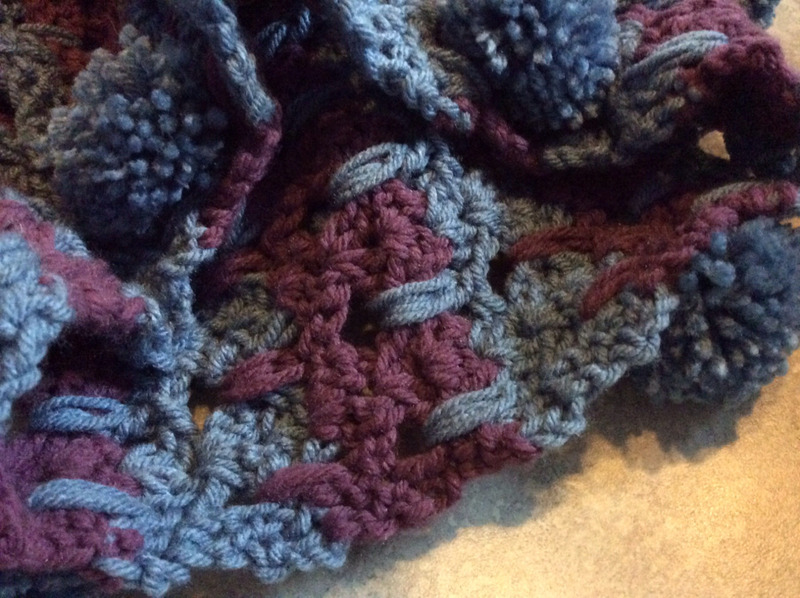 The pattern was fairly easy to make, and I learned a new stitch as well as the best method (in my opinion) of making a brim. The pattern calls for the brim to be simultaneously made and attached to the hat, thus eliminating the hassle of sizing the brim to the hat and attaching it. 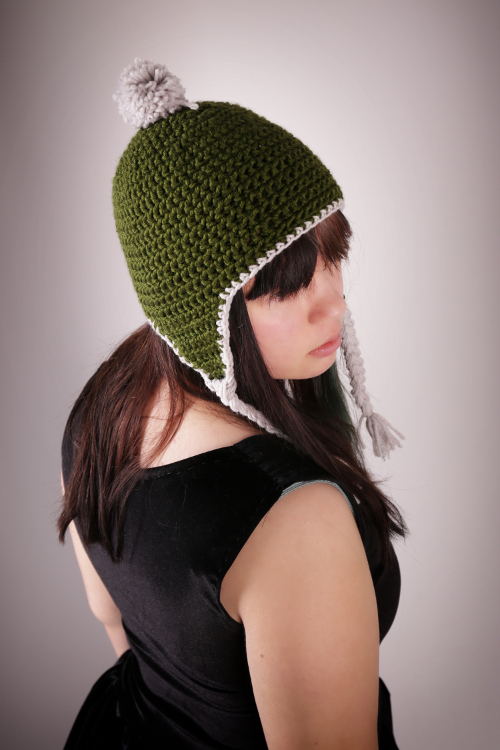 I will definitely be using this brim method for all of my future crochet hats! All of these scarves were made over the summer before I moved for some of my relatives. 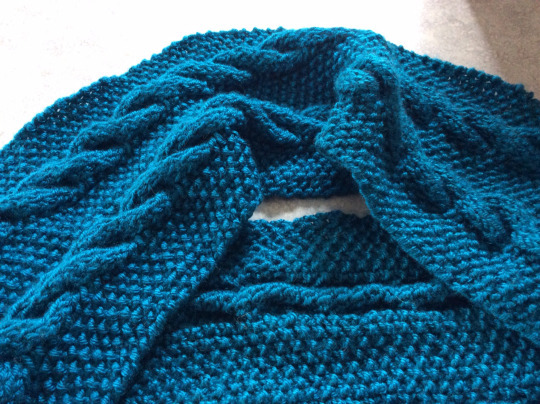 This cowl was knitted using the Infinity Trinity Cowl and Wristers pattern. 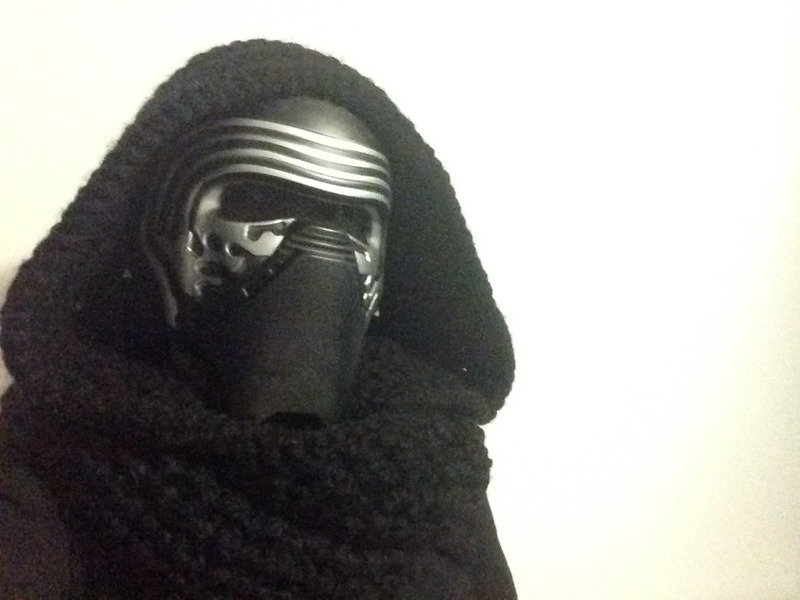 I only made the cowl. 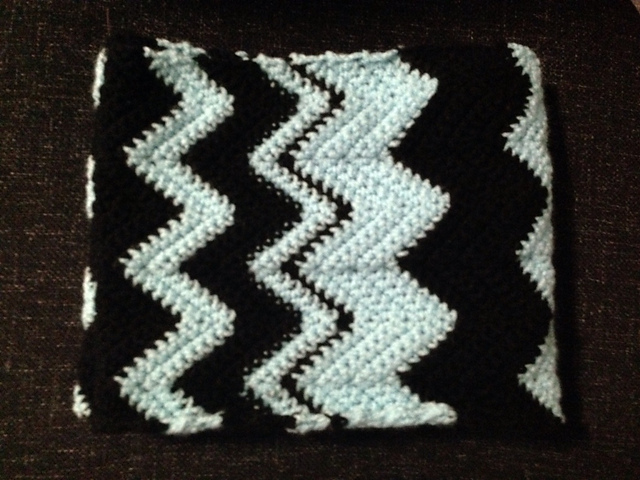 It was an easy pattern to do, and an easy pattern to memorize, which made it nice to work on while watching TV. The only thing I’m not happy with is the seam joining the ends together. It’s a solid seam that won’t tear apart, but it’s very obvious. 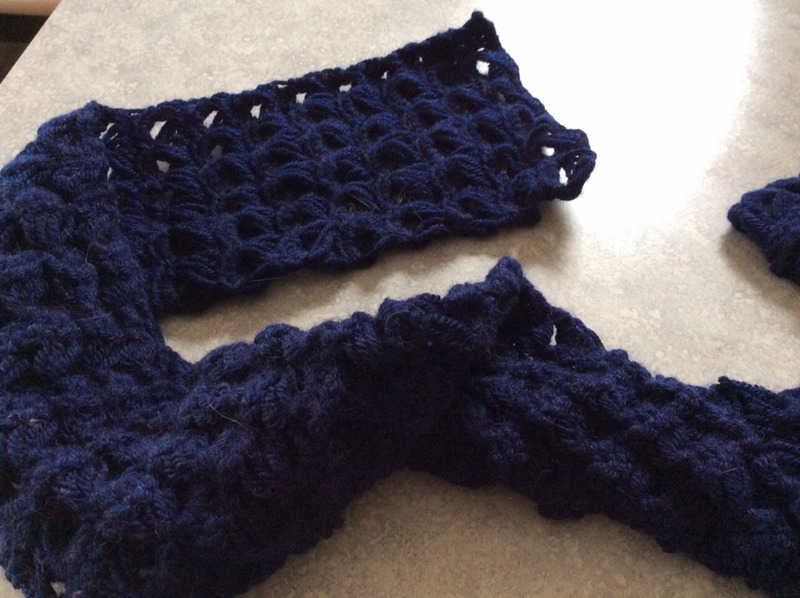 This is based off the Broomstick Lace Infinity Scarf, but I lengthened the pattern so that it is instead a regular scarf. 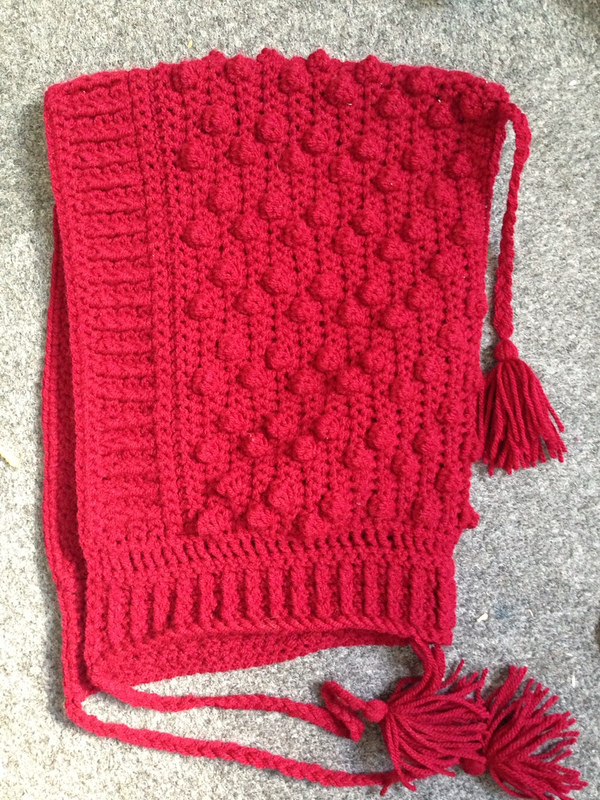 Another super easy pattern good for doing in front of the TV, although holding a huge knitting needle and trying to crochet around it at the same time takes a little focus. 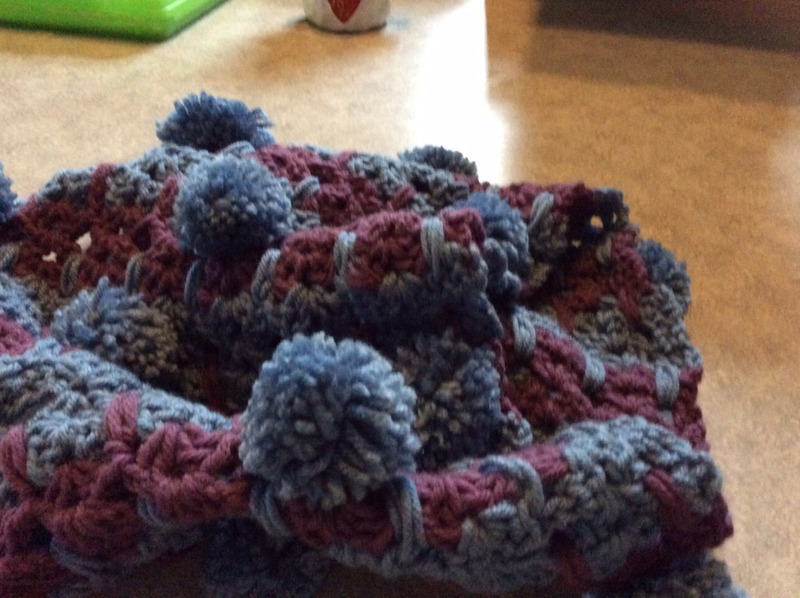 This crocheted cowl has Abstract Crochet Cats and pom-poms! What’s not to like? This design was fairly easy to make, and my mom convinced me to add the pom-poms as a fun addition. I discovered that to make the cats look more like cats, the stitches done ‘in between the ears’ should be done AROUND the stitch instead of through it. Can you see the cats? These are the two hats I knitted for my friend Ruth for Christmas. 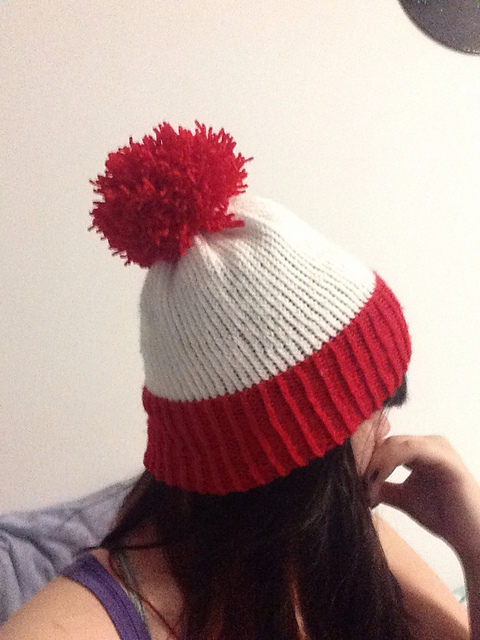 She asked for a Where’s Waldo Hat, and I messed up the first hat, which is the one on the left. 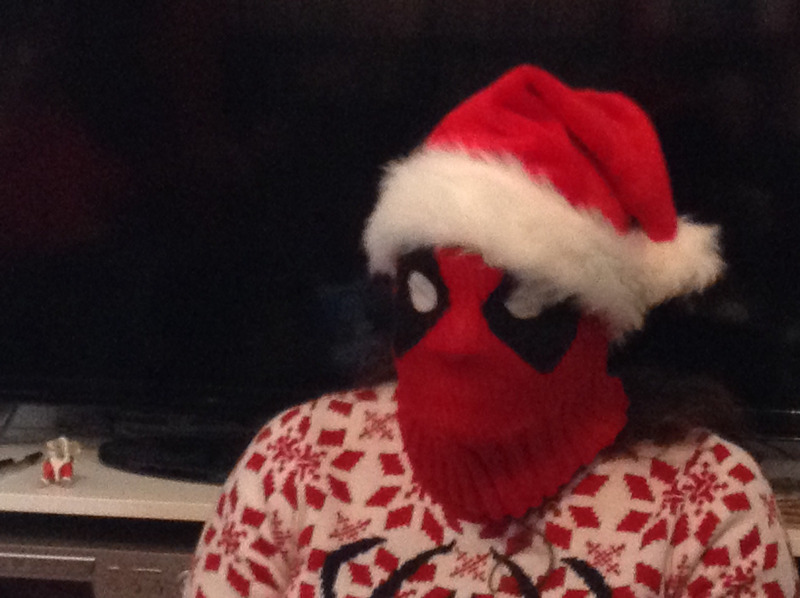 It is clearly not a Where’s Waldo hat, and is instead a Santa hat. I realized my mistake too late, and so finished the Santa hat before moving on to the Where’s Waldo one. 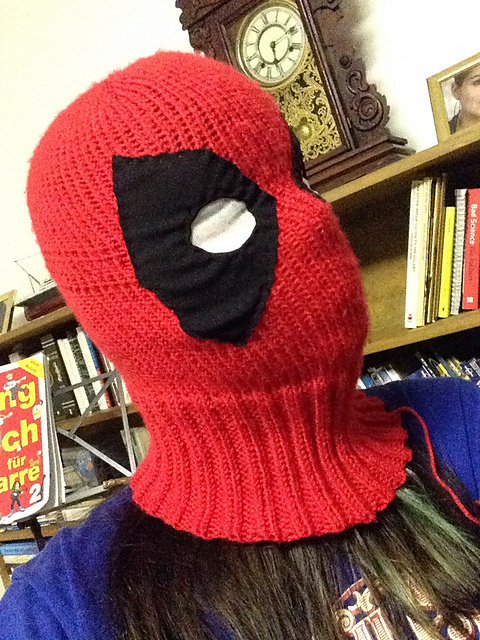 This is the Deadpool hat/balaclava I made for Ruth’s sister. The base is knit in red following the Jackyll & Hide pattern, and I hand sewed on black shapes to outline the eyes, and then put white netting underneath so that it could be used as a mask. 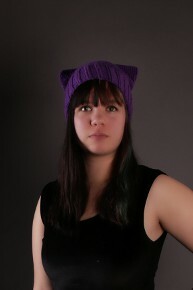 I made this hat for a knitting trade with my friend Katie. We wanted to do a trade of ‘ugly hats’. 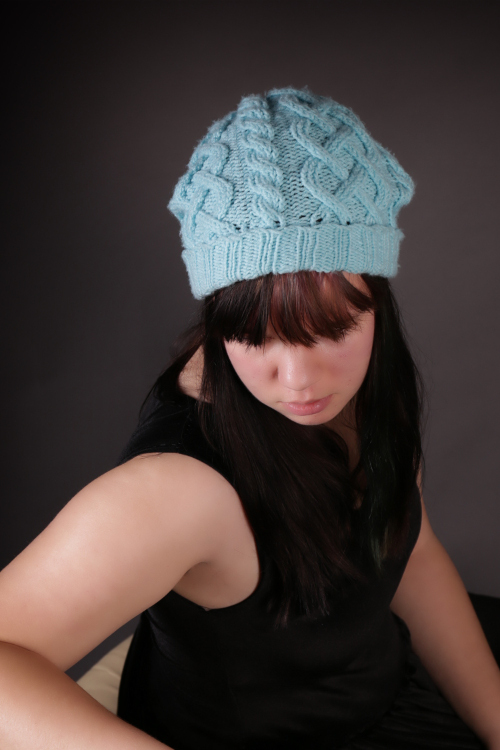 I worked with both colors at the same time from opposite sides of the hat to create a striped pattern that spirals to the top, where I made the biggest pom-pom I could. 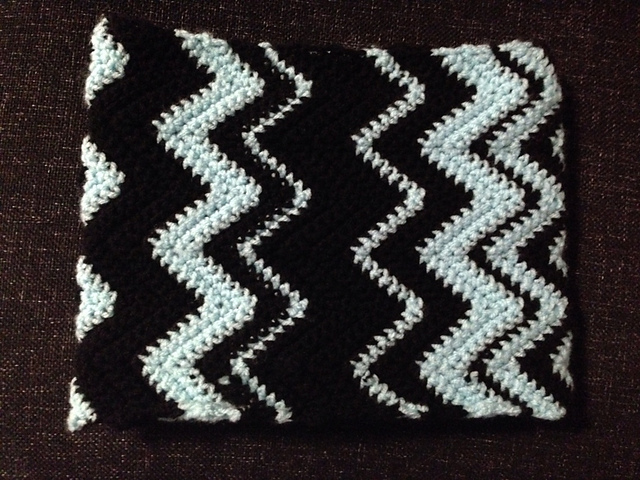 This zig-zag scarf was made for my friend Nicole’s birthday. I decided on each row’s color by flipping a coin for each row, resulting in a lovely, truly random pattern. That’s right, it’s an R2D2 hat! 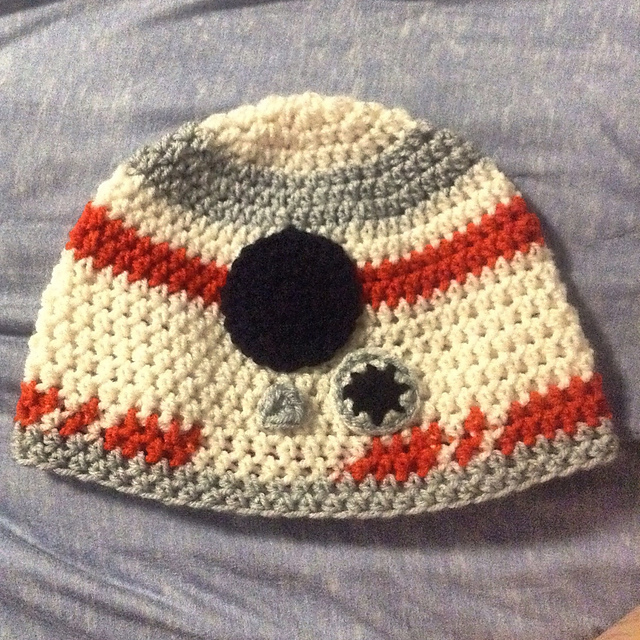 I made this to celebrate the new Star Wars movie, and used the Star Wars Droid Beanies pattern. I modified the hat a little bit by adding two extra rows, one where the hat is solid grey, and one at the bottom. Yes! Another Star Wars hat! This one is BB-8, a character from Star Wars: The Force Awakens. I used a BB-8 Droid Hat Pattern, and modified the circles to be smaller, and looking at the robot in order to judge where to put them. During winter break, I went to Austria with my friend Ruth and stayed with her family. While in Austria, Ruth and I visited her photographer friend, Bildersanatorium, who was kind enough to take photographs of the many pieces I have made since September. 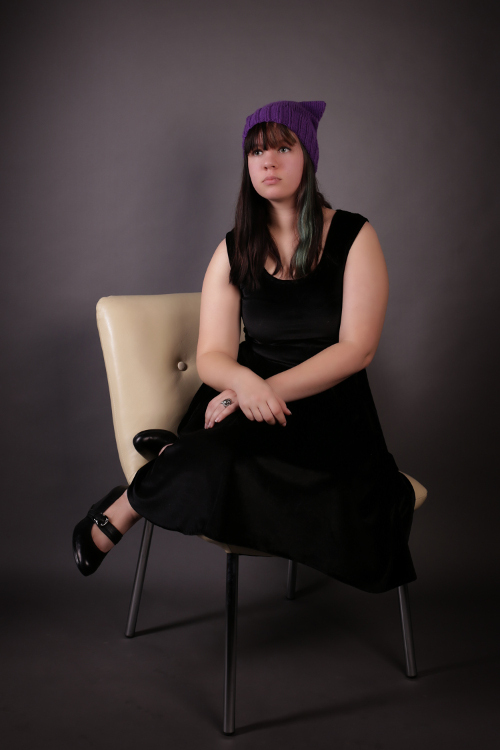 I had made this hat to match a scarf I’d made, but I lost the scarf almost immediately upon its completion. 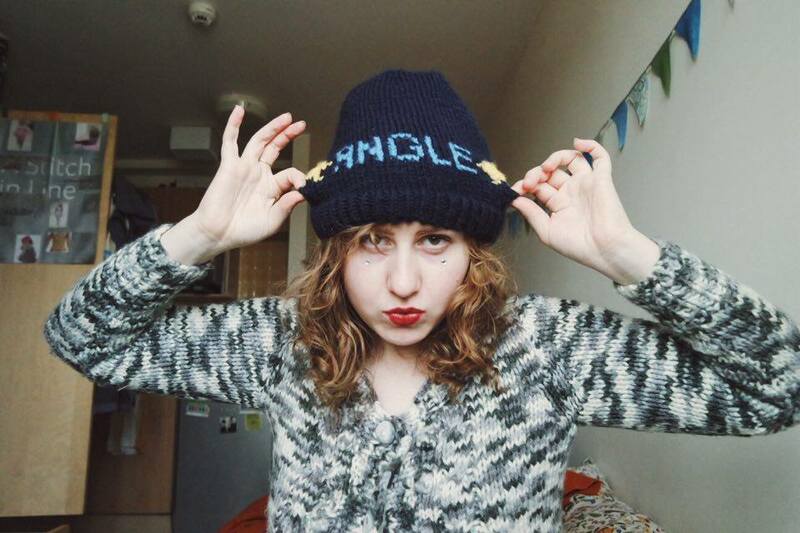 This hat was the second thing I made after moving to England. 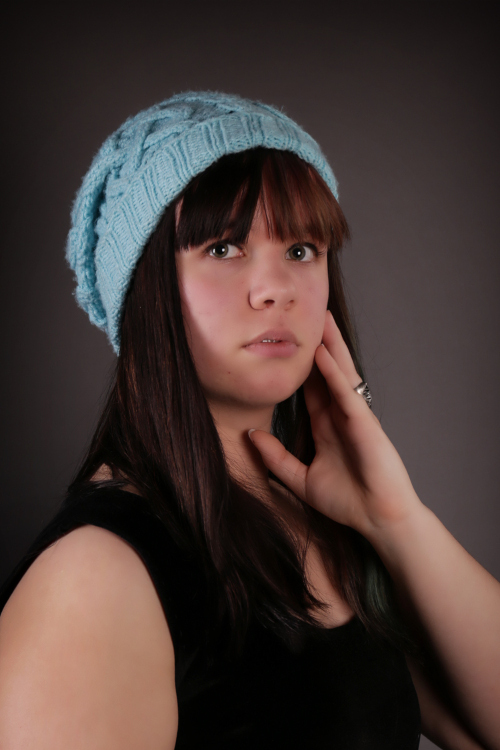 It’s a very simple earflap hat made from double crochet and single crochet, with braided tassels and a pom-pom. 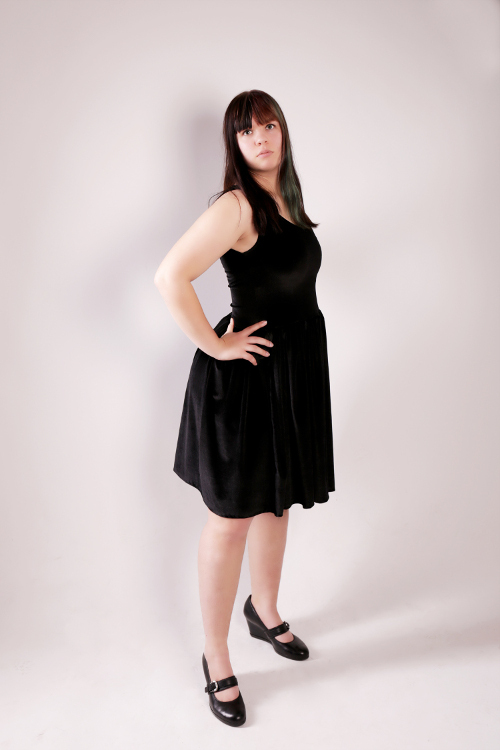 This dress is made from a very nice stretch velvet I picked up from BSP Haberdashery. I felt it, and I just had to take it home with me. I made up the dress pattern as I went along, copying one of my tank tops for the bodice, and gathering two rectangles for the skirt. 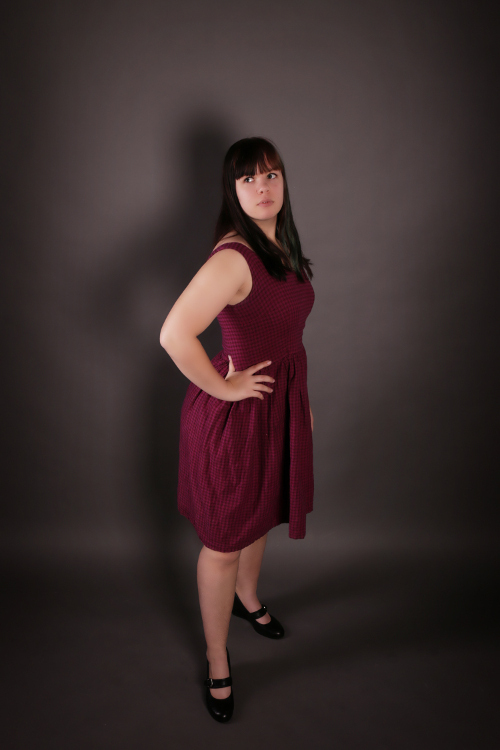 The dress is so simple that I was able to hand sew the entire dress in one night. 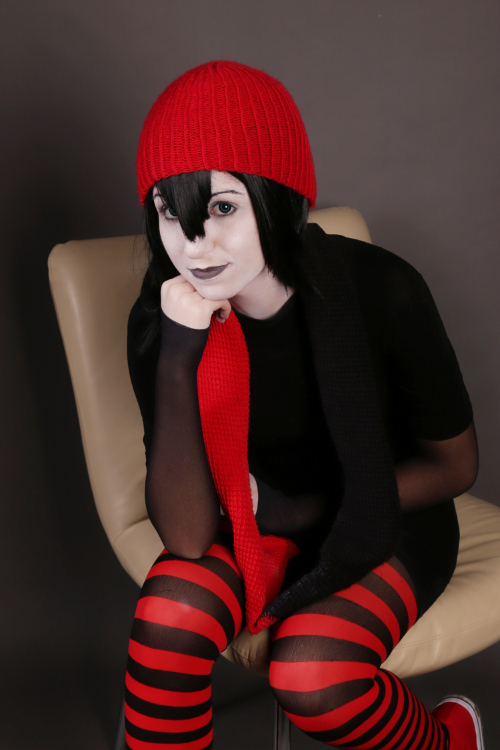 This is my friend Ruth in cosplay as Mavis from Hotel Transylvania. She is modeling a knit hat and a crocheted scarf. 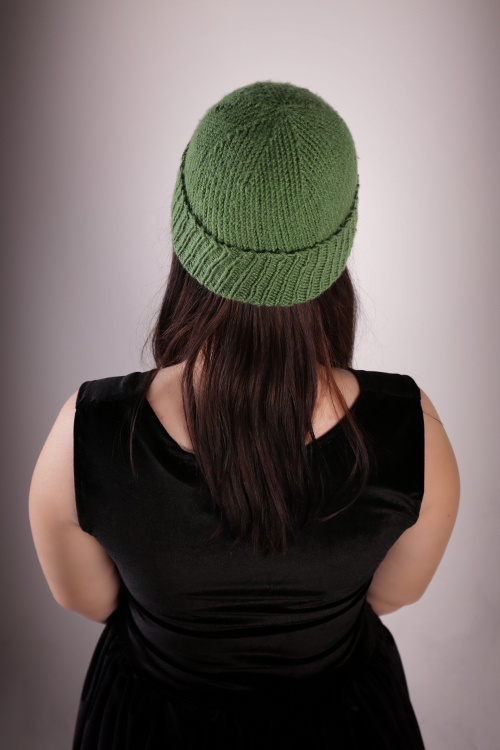 The hat is a super simple pattern, I just altered knit and purl stitches until it reached the length I wanted, and then decreased. 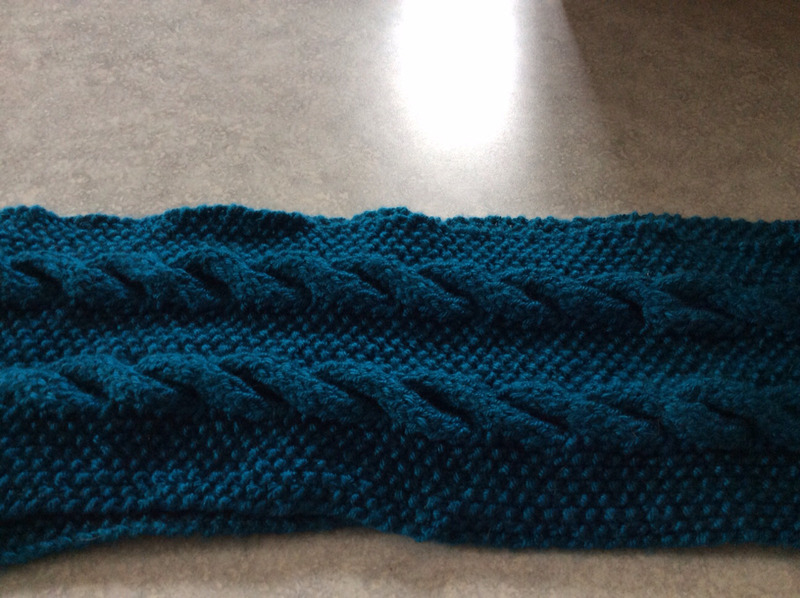 The scarf is made from the basic tunisian crochet stitch, which ended up making the fabric very thick and warm, but also caused a strange drape. 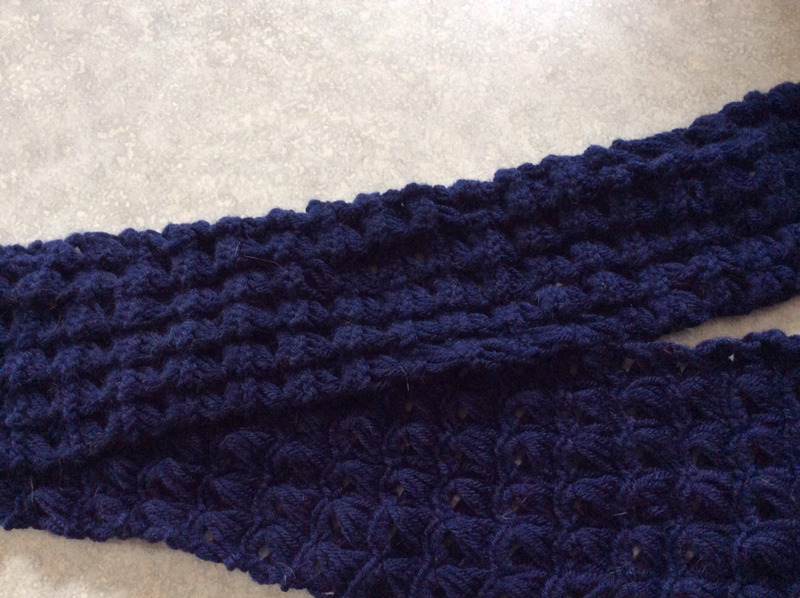 I started making the scarf in red, but switched to black when I ran out of red. I made this hat for Ruth’s dad for Christmas. 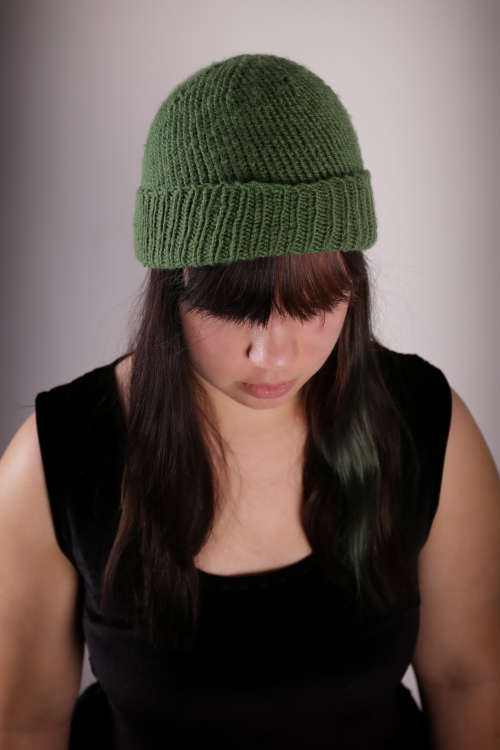 It’s a plain knit hat with a ribbed cuff. This hat is made for Ruth’s mom using the Kitkat Hat Pattern. 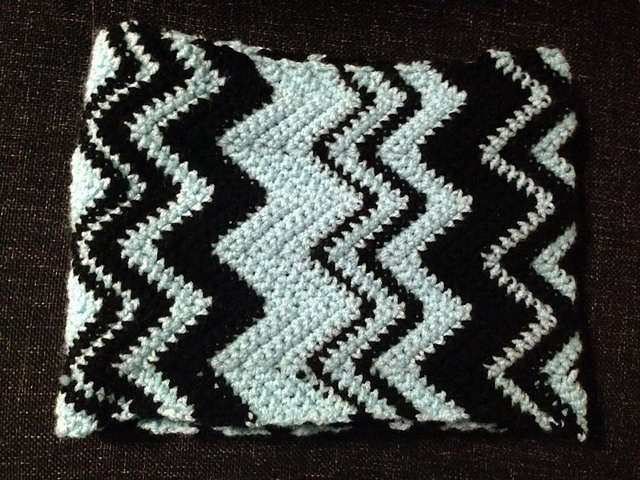 The pattern was super easy to make, and I love the result! This is my favorite hat. It was my first time working with cables in a pattern and I love it so much! 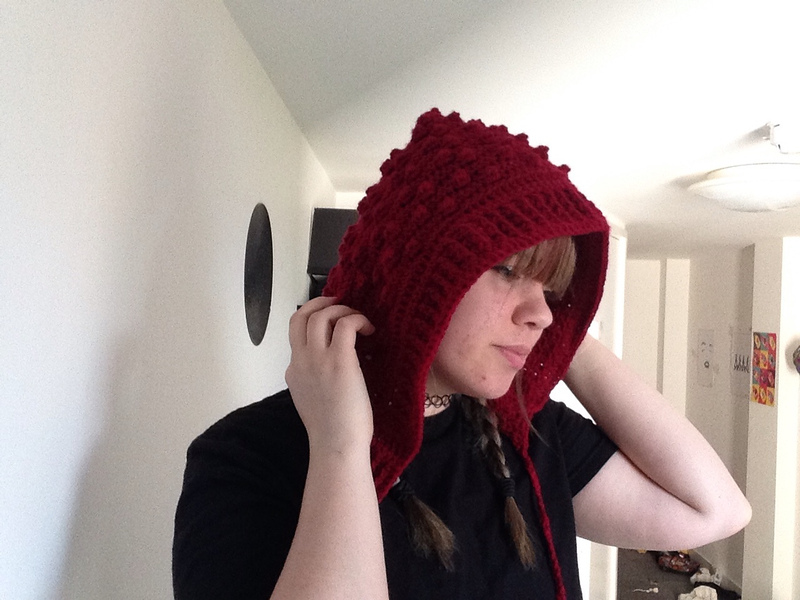 I used the Traveling Cable Hat Pattern and I found the instructions very easy to follow, although I did get confused while I was making the ribbing and messed up a bit. 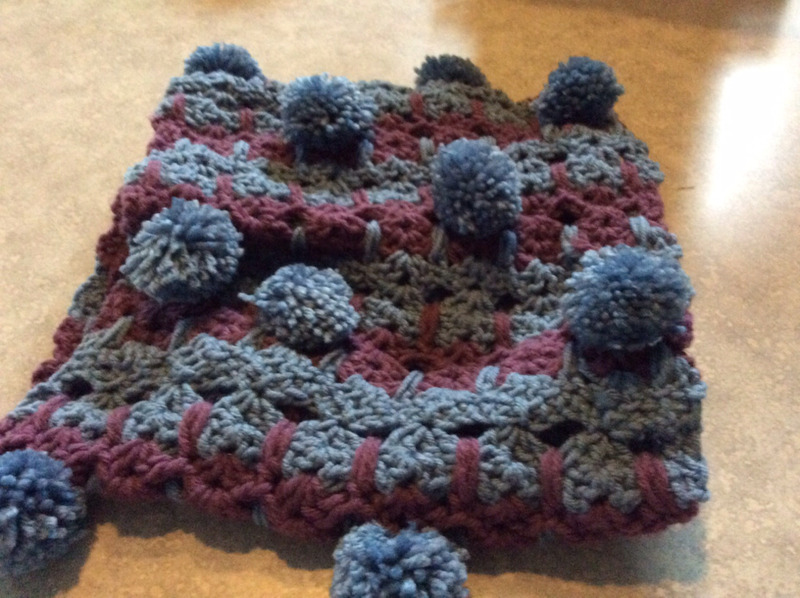 If you want to see in progress pictures of my hat, please click this link. 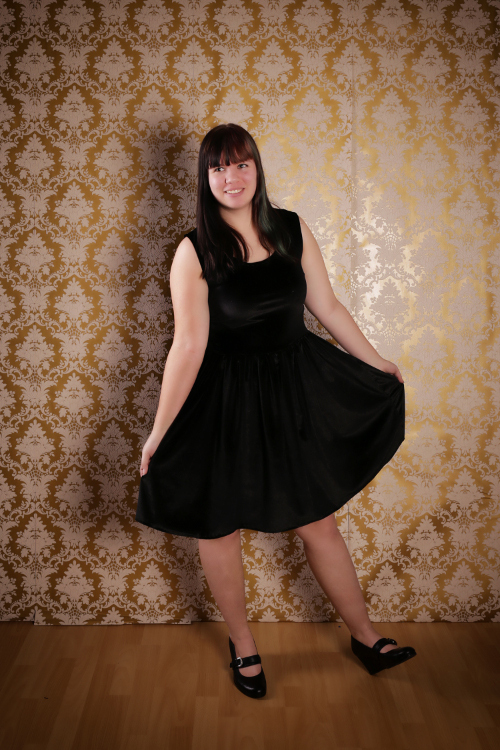 This dress is actually a project from spring of last year. 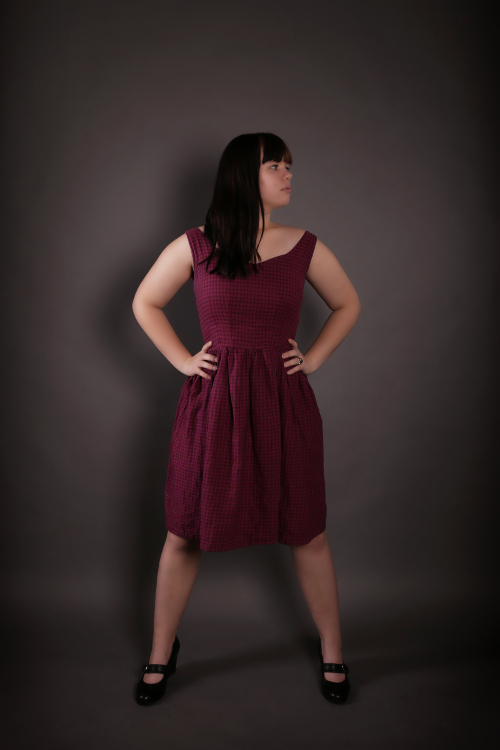 It’s made from the same pattern as the French Fry Dress out of a soft woven plaid fabric. I did not match the plaid because it is a very small print, and I lined the bodice with the same fabric used in the rest of the dress. 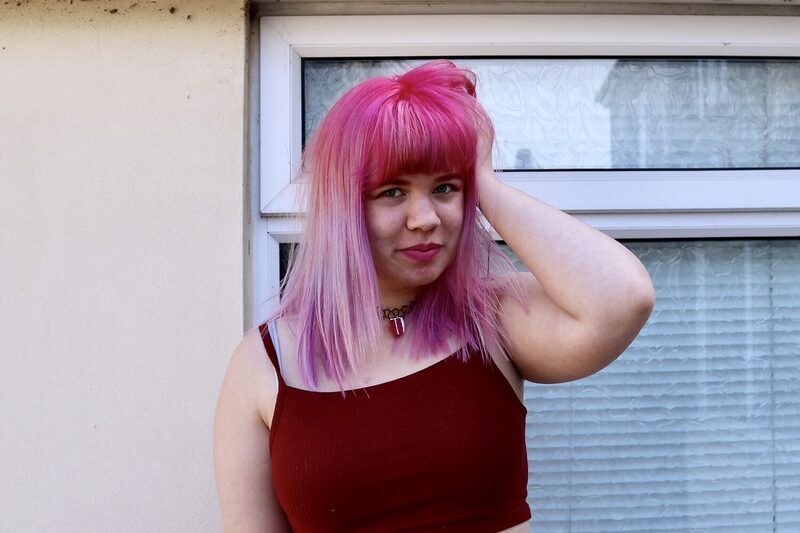 I am planning on posting more often this year, and hopefully I’ll stick to that promise! All the way back in December, during winter break, I made five hair bows! I made them out of various fabrics that I had in my stash, and gave two of them to my friend Megan for Christmas. I received two yards of french fry fabric for Christmas from my dad, and will hopefully be able to take photos of to post soon. I realize it’s already November, but I’d still like to share the Halloween costumes that I helped some of my friends with! 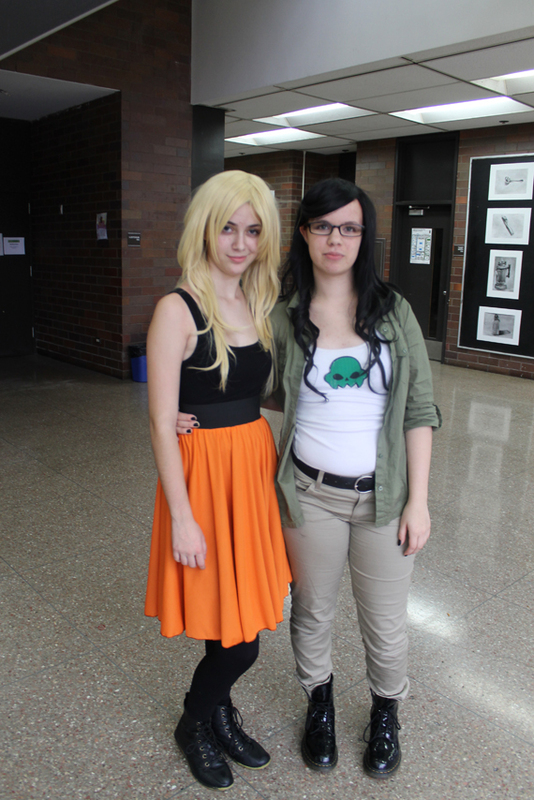 Here you can see a picture of Genny dressed as Dirk Strider. As you probably remember, I made the skirt that she’s wearing out of a stretch knit, although the applique isn’t visible in this picture. 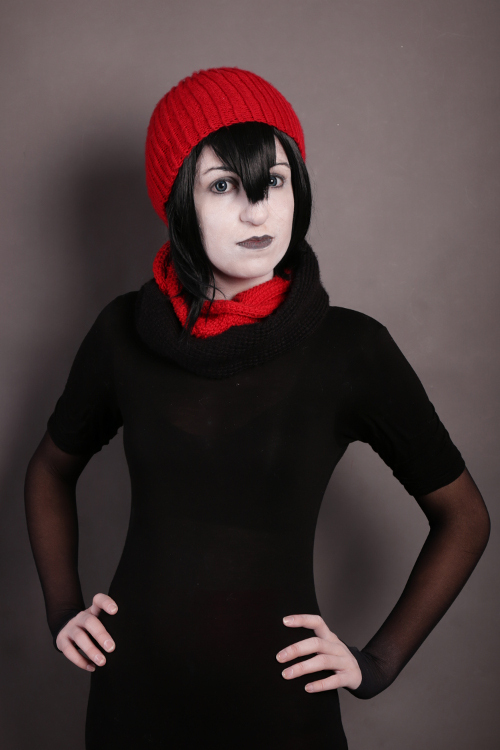 I’m dressed as Jake English, another character from the webcomic Homestuck. 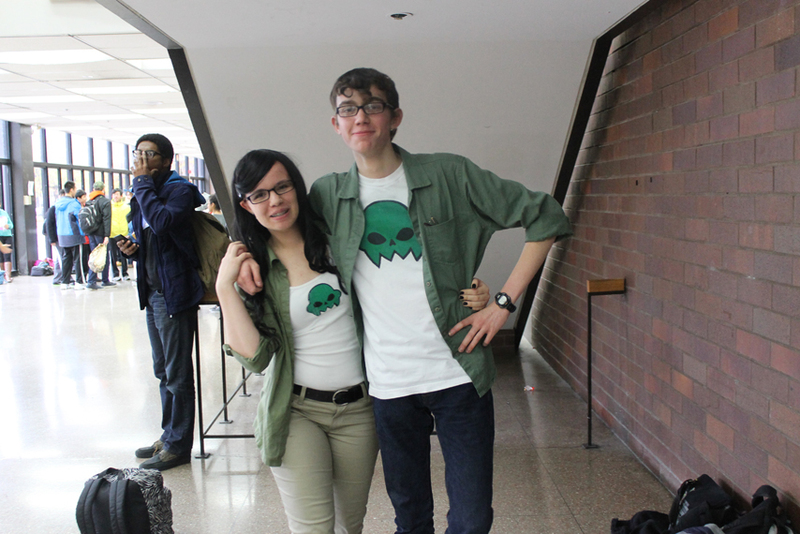 This is my friend Noah, who also dressed as Jake English this Halloween. I screenprinted both of our shirts in two colors, copying the design directly from the character’s t-shirt. 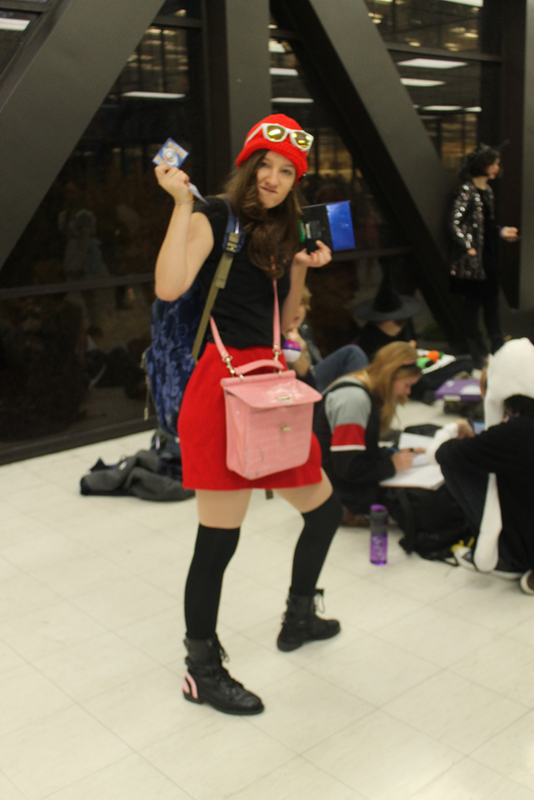 My friend Laurel wanted to be a Pokemon trainer from x and y, so she asked me to make her this hat. 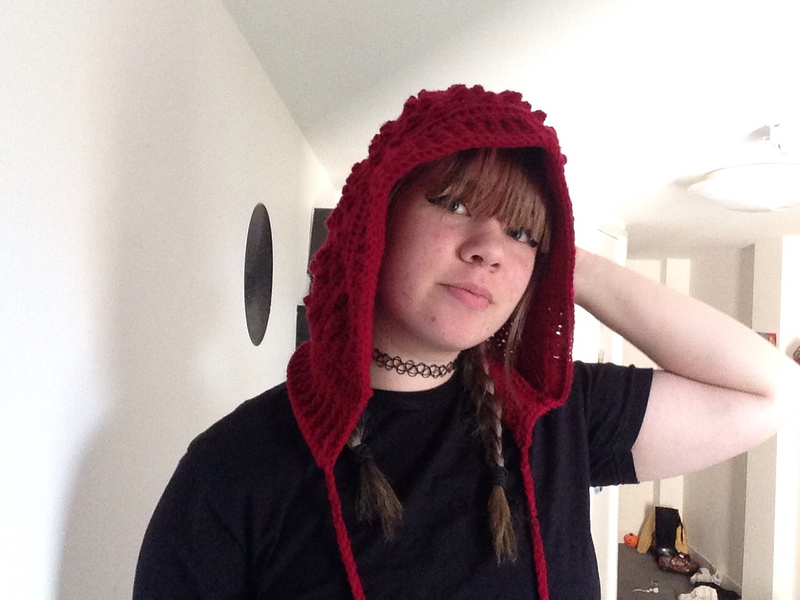 I made the hat based off of a pattern by Pinar Vardar on Ravelry. 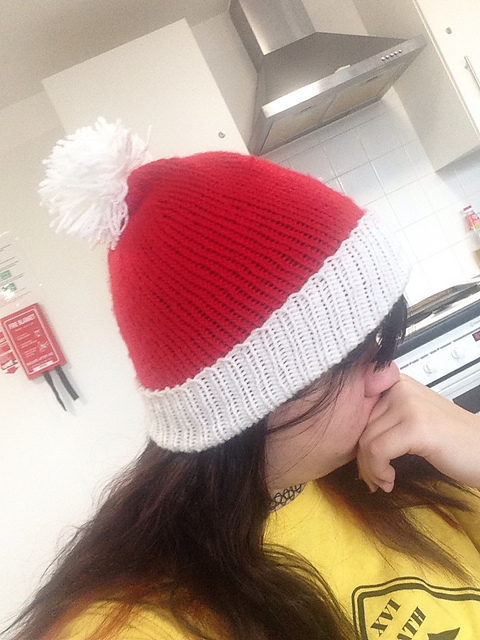 I had to change the entire base of the hat because I used a very different weight of yarn. These cupcake bears are crocheted out of yarn with felt eyes and an embroidered mouth and nose. 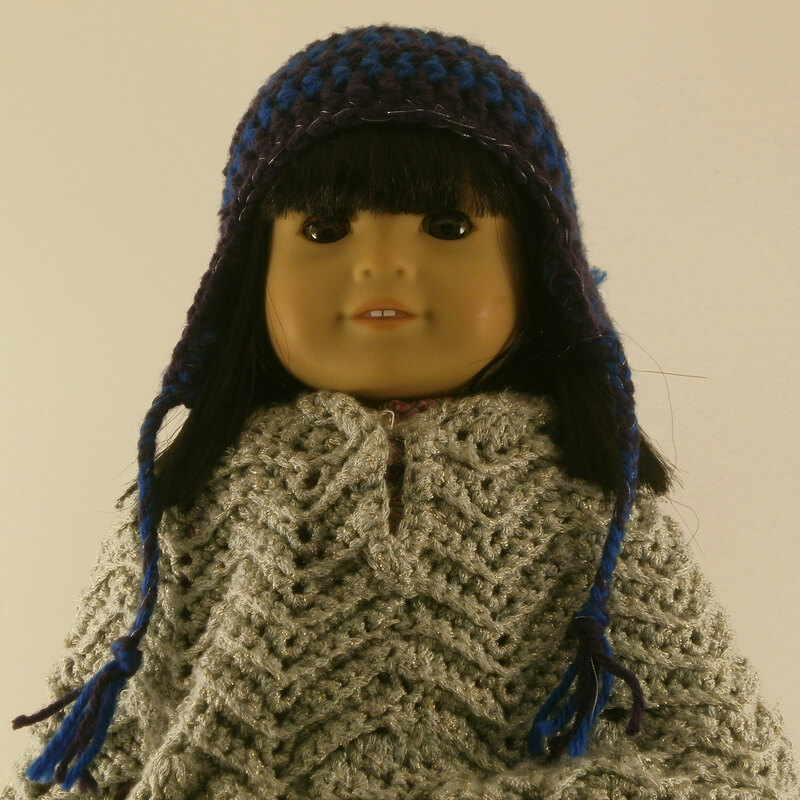 This is a crochet hat pattern that I designed for my little sister’s American Girl Doll. 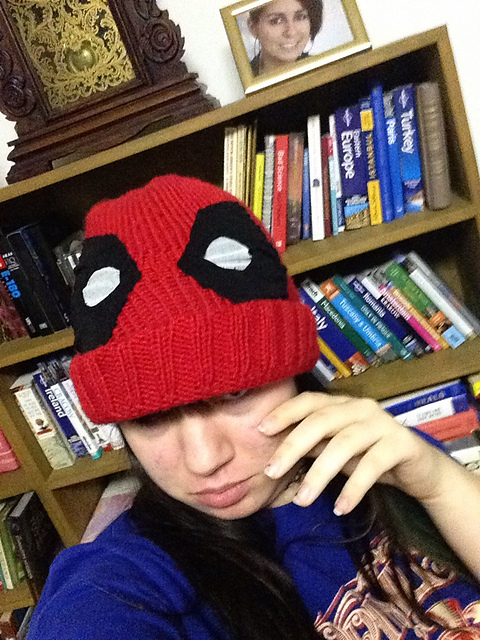 The hat has two earflaps, and will fit nearly every 18″ doll. 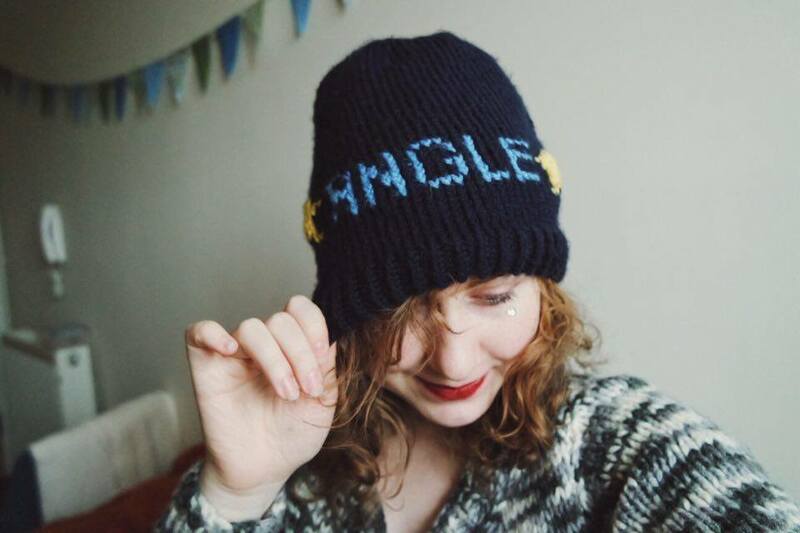 Currently for sale on Ravelry for $0.85!